Technically, Art Deco Jewelry was made between 1918 and the 1940s. However in the History of Jewelry dates are insensible because design periods often overlap, and besides the arts cannot be pigeonholed in this way. Coinciding with the roaring twenties, the Art Deco Golden age of fashion and Jewelry lasted only a short time. And with just under a decade to go before Art Deco Jewelry can legitimately proclaim its 100 year old antique status, there's never been a better time to Invest in Deco Jewelry. 1. It's not too difficult identifying Deco Jewelry so suitable for those starting out. 2. Authentic pieces are easy to find. With its attractive linear design, Deco Jewelry is often displayed at the centre of Antique Jewelry stores as it's a perennial favourite and never seems to date. Jewelry Collectors will find some useful tips about how to tell the difference between Authentic Deco jewelry and Antique Costume Jewelry. If you're still undecided, read more good reasons why you should consider investing in Antique Jewelry - 10 Reasons to Invest in Gold Jewelry! You don't have to be royalty to invest in fine Antique Jewelry. At one point in time youactually did! Art deco originated in Paris in the 1920s. The name "Art deco" was only one of a number of candidates for the completely novel and imaginative way of looking at objects. Derived from the 'The Exposition Internationale des Artes Decoratifs et Industriels Moderns' of 1925. Hardly more than 20 years before the Art Nouveau period, la belle époque fashion had favored gentle curves and sinuous shapes. The creative period that fostered this brief, revolutionary period in fashion and art history lasted only until the outbreak of the second world war. The seriously innovative and very trendy jewelry designs of the Art Deco period would never be recaptured but fortunately for jewelry investors, many examples of the jewelry of this period still remain. Abstract motifs and geometrical forms with an emphasis on vertical lines are keys motifs. Necklaces hung low, often with an elaborate jeweled pendant, called a Sautoir. 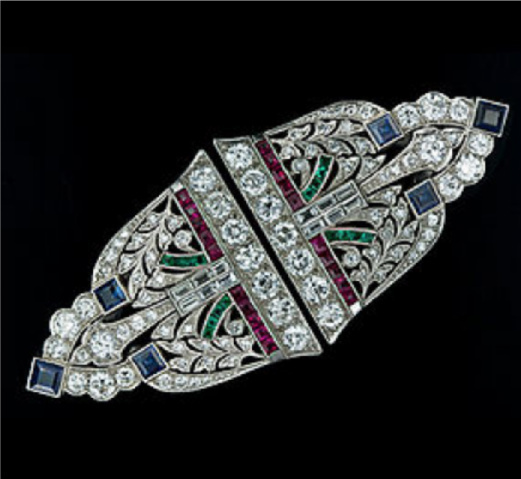 Art deco was a major influence of "faux" costume jewelry under the wings of haute couturier, Coco Chanel and many of the handcrafted jewelry boxes of fashion forward women, housed both fine and costume jewelry. Haute Couturier, fashion designer Coco Chanel forerunner to Eliza Schiaparelli, born in Rome, Italy in 1890, captured the mood precisely with her Costume Jewelry designs. Long, streamlined and vertical lines with the introduction of masculine elements. Anything a man could do, a fashionable forward art deco belle could do better. Cutting her hair into short boyish hairstyles marked a "cutting" point in a woman's struggle for equality. The short hair cut was the perfect frame to showcase the long shoulder duster Art deco earrings that were all the rage during this period. Sleeveless dresses and the shedding of evening gloves encouraged the wearing of bracelets. Usually of the extra large bling style and quite often worn in pairs, one on each wrist. Gem-encrusted geometric link style bracelets were also in fashion and remained in fashion until the outbreak of the Second World War. Schiaparelli went on and licensed her name for mass production of costume jewelry and accessories made by David Lisner Co., an authorized American agent and distributor for her earlier French-made pieces. Her earlier jewelry is typically Art deco in design - "showy" imaginative and bold with innovative designs. Later designs reveal Art nouveau elements of nature. From the Art Deco lighting and candelabras to Art deco Jewelry, linear forms, vivid colors and flamboyant style are the quintessential hallmarks. For the ultimate Art deco indulgence, if you go to LA head over to the Roosevelt Hotel. From the Art deco architecture, the seating and leather club chairs to the baronial fireplace, the lobby of The Roosevelt, LA, looks like it's straight out of an old Dolores Del Rio movie and there's even a waft of Latin lover, Rudolph Valentino passing by! A Hollywood landmark since 1927 and home to the first-ever academy awards. Never underestimate the power of the Antique jewelry box for efficacious Jewelry Storage! An important point on the subject of "boxes" for Antique Jewelry Investors; Jewelry is more valuable in its original box. Geometric shapes and the use of vivid and bold colors scream 'Art deco'! Linear lines and flamboyant style make it fairly easy to identify, with the help of Antique Jewelry Investor's essential Art Deco tips, which are available for purchase further down on this page. See the Duchess of Cornwall's Art Deco Diamond Engagement Ring that formerly belonged to the Queen Mother Here. The Art deco movement touched on every aspect of applied art, not just jewelry- architecture, furniture, ceramic, glass, book design and even industrial design. The Art deco period saw a major technical innovation - Van Cleef & Arpels' invisible setting allowed gemstones to be closely set together without the use of prongs. This French Jewelry manufacturer has been creating High Jewelry on Place Vendome since 1906. Georges Fouquet, Sandoz, Templer, and Brandt, were outstanding Art Deco jewelry designer craftsmen of the era. Download ALL My Essential Art Deco Tips For Free!